WASHINGTON — Startups Kepler Communications and Phasor said Sept. 10 that they successfully demonstrated a link between Kepler’s cubesat and a Phasor flat panel antenna. Antennas that use electronics instead of mechanical systems to track satellites are considered important, if not critical, for low-Earth orbit broadband systems. Electronically steered antennas can link to two or more satellites simultaneously — a feat that single dish antennas cannot perform. Kepler and Phasor said the test showed the antenna tracked Kepler’s first cubesat to 20 degrees above the horizon. Kepler co-founder and vice president of business development Jeffrey Osborne told SpaceNews by email that the tests show the company should be able to achieve a 10 Mbps downlink, 10 Mbps uplink connection with a 30-square-centimeter Phasor antenna. The test used a “representative antenna,” instead of a final product, he said. 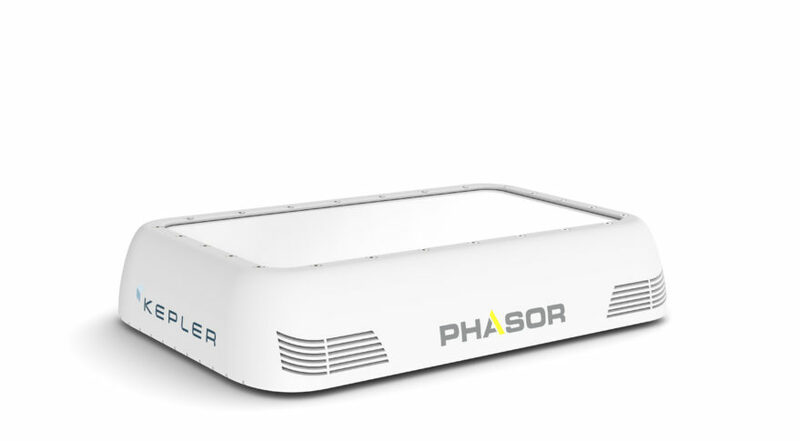 Phasor anticipates releasing its first antennas late this year or in the first half of next year. Kepler is planning a constellation of 140 Ku-band satellites by 2022 for connecting Internet of Things devices and serving as an in-space relay for other spacecraft using intersatellite links. The company has its second of three prototype satellites from ÅAC Clyde launching later this year, and has issued a request for information regarding the launch of up to 15 satellites by 2020. Osborne declined to say what vehicle Kepler’s second satellite will launch aboard. Having two satellites could allow Kepler and Phasor to do “handover” testing, where the antenna transitions communications from one satellite to another as they pass through the sky, but only if the satellites are close enough in space to be seen from the same spot on the ground. Kepler hasn’t determined the orbit of the second satellite, he said. In a statement, Kepler CEO Mina Mitry said customers using Phasor antennas could in the future switch between different satellite constellations to optimize data traffic management. The companies said they will continue testing the antenna over the coming weeks.